Seagrass is a natural renewable fiber, harvested in the ocean which provides a great beach look, feel and smell to any car interior. 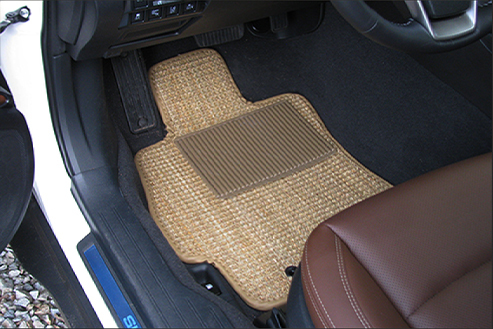 Seagrass Car Mats will mature from a light green color to a more golden tan color over time. Our seagrass is farm grown and the beds are highly diverse and productive ecosystems harboring hundreds of fish and other aquatic species. Click here to visit our Virtual swatch pages. Just open up the page on your ipad, tablet, iphone or smart phone and select the material and color of your choice. Place the device on the floor of your car to see a true rendition of how this car mat color will look. For more colors simply swipe the screen left or right. When you find your favorite, simply tap the screen once and a caption will drop down informing you of the color name and number. Still not sure? Swatches are availble for $1 a piece + Free Shipping. Just go to our Order Swatch Page or give us a call. Also, we always appreciate it if you mail swatches back to us after you have made your decision so that we can recycle them to other customers.